The plunger lift industry has been mostly unregulated to date, leading to installation of equipment that is unreliable and unsafe on plunger lift wells across the country. Well head surface equipment sometimes takes very severe impacts from plungers, leading to failures that can result in spills or injuries. Because of this, there has been a push from industry to come up with a common set of standards that helps to provide some regulation for plunger lift equipment. A new specification from the American Petroleum Institute (API), 11 PL is emerging in plunger lift, covering plunger lift lubricators and related equipment. Operators and equipment manufacturers have collaborated over the last few years to create a common set of standards for the plunger lift industry to help identify quality manufacturers who properly design, construct, and test plunger lift equipment for reliable, safe operation. One of the main outputs of this new standard is the requirement for manufacturers to provide a kinetic energy rating for their lubricator and spring combinations. This rating helps to identify the types of impacts that their equipment can take and allows the control system to compare real time kinetic energy measurements. Kinetic energy allows us to measure, track, and react to real impacts at surface instead of relying on velocity or over engineering of equipment to ensure safe and reliable operation of a plunger lift well. The kinetic energy of an arriving plunger can be calculated using the mass and velocity of the plunger. The mass of the plunger is already specified by plunger manufacturers leaving us to measure velocity at surface in real time in order to calculate the kinetic energy. Historically, operators have been content to rely on average velocity of a plunger, which is calculated from the well depth and the time for the plunger to rise. This is not nearly accurate enough to be used for the kinetic energy calculation as it does not account for acceleration or deceleration and whether the plunger started at bottom of the well or not. The Sasquatch plunger velocity sensor is a new innovation from ETC that uses Geomagnetic Sensing Technology™ to measure, store, and relay the plunger arrival and the surface velocity of the plunger. This gives an accurate velocity of the plunger in real time just before it strikes the anvil. The ALiEn2 plunger lift controller or any other real time plunger control system can take the surface velocity and combine it with the mass of the plunger to get the kinetic energy of each plunger arrival. This can be compared to a user defined threshold to determine if any other action needs to be taken. In all ETC controllers, the user can specify both a hard hit and dangerous hit threshold. 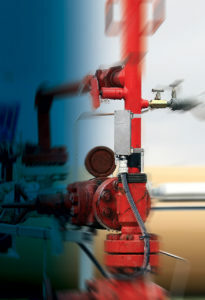 The controller watches for a specified number of consecutive hard hits and will automatically shut down operation of the plunger well to protect equipment. If a plunger arrives that exceeds the dangerous hit threshold, the operation of the well will be stopped immediately to allow the operator to inspect the equipment before continuing. ETC is also working with a number of operators to refine a predictive maintenance model for spring wear. This model takes the cumulative kinetic energy of each plunger arrival and uses it to predict when a spring will fail. The goal of this technology is to reduce the number of physical inspections, while reducing the amount of premature replacements. Currently, most operators either replace their springs on a schedule, causing issues when springs fail early, but also replacing springs that may last for longer periods of time. Many other operators simply run their springs to failure, leaving the opportunity for catastrophic failures that could be easily prevented. For more information on API 11 PL, please contact ETC. To learn how ETC uses velocity for safety and maintenance in plunger lift, click here. For information on our new Plunger Velocity Diagnostic Kit, click here.